WELCOME TO OUR DELIVERY SERVICE. local delivery to San Francisco pet lovers. Let's get started. We deliver Monday-Friday throughout San Francisco. Order online by 8am to get same day delivery or at any time to schedule your delivery for another day. Pawtrero will deliver directly to your front door. FREE delivery with $50 minimum order. 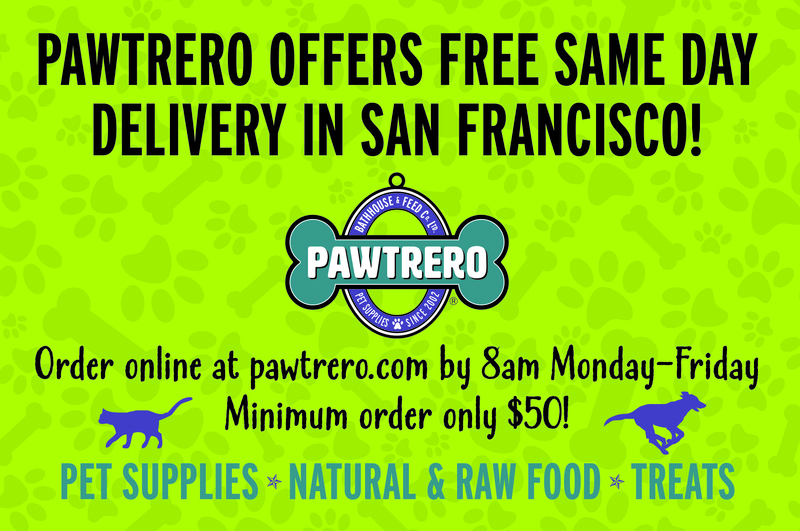 Pawtrero delivers to all neighborhoods and businesses throughout San Francisco Monday-Friday. Order online by 8AM for same day delivery and choose from one of our three delivery windows per day. To order items for delivery that are not found on our website. Please call Pawtrero on Brannan at 415-882-7297. We may be able to place a special order.